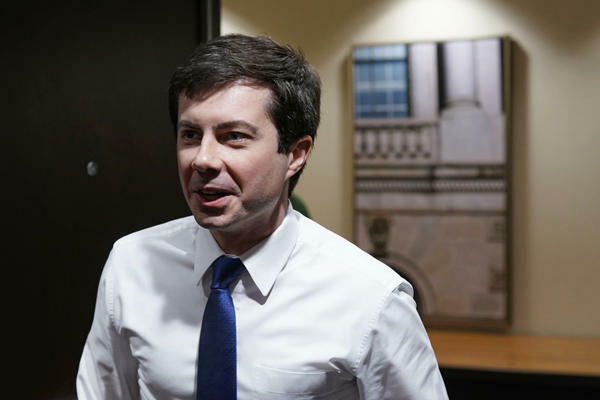 Pete Buttigieg, the mayor of South Bend, Ind., announced on Jan. 23 that he is forming an exploratory committee to run for the Democratic presidential nomination. He first rose to national prominence in 2017 through an unsuccessful bid to serve as chairman of the Democratic National Committee. A millennial from a red state, Buttigieg positioned himself as a third path for Democrats in a leadership race defined by the split between the party's establishment and progressive wings, but he dropped out shortly before the ballots were cast. In a conversation with NPR about his memoir Shortest Way Home, Buttigieg says that the 2020 election should be focused on what he calls "inter-generational justice." He says he worries about what the United States will be like in 2054 — the year he would turn 72, the current age of President Trump. "We have got to change the trajectory that we're on so that mine is not the first generation to be worse off economically than my parents' was," Buttigieg tells NPR's Steve Inskeep. "If there's one center of gravity to all of it, I think it's this question of the future." We transformed the trajectory of our city. This is a community that was written off as dying at the beginning of this decade. Now it's growing again. We had a massive problem with vacant and abandoned properties, an economy that felt like it was stagnating. And we were able not only to deal with some of our local problems, but also to work on closing the gap to the numbers for other parts of the country. I think any executive role — especially the presidency — there are three parts to it. It's competently running an administration, it's implementing good policies, and above all, it's calling people to their highest values in tough times and bringing them together. I think a good mayor does that. I think we've been able to do that in South Bend. I think that's missing in the White House right now, and that's got to change. We tried to make sure that we were diversifying our economy. We recognized that the auto industry that built our city was not going to come back in its old form, and so we had to conquer the nostalgia and the temptation to do what sometimes is called "smokestack chasing" — a giant, lucrative economic incentive in order to land the big facility or factory that's supposed to be the salvation of our problems. Don't get me wrong, we're still doing manufacturing ... but we recognize that it's increasingly automated and there's got to be more to the story. That's why we're growing an industry in data centers and industries that didn't even exist when our town was making Studebakers back in the '60s. Any time you run for any office you reveal yourself to be ambitious. Every time I've decided to run and every time I've decided not to run – which has happened after some recruitment efforts for Congress and a question over whether to run for governor — it's always motivated by this basic set of questions. Question No. 1: What ... does the office call for? And question No. 2: What do I bring to the table? I never would have guessed growing up — or frankly as recently as two years ago — that I would possibly be talking about national office. And I'm also conscious — as someone from a new generation, somebody living in a part of the country that has been neglected but in many ways holds the key to, I believe, our social and political life — that I have something to offer that is different. And the only way to find out whether enough people agree will be to step out onto the national stage. I understand this is very much an underdog project. But I also don't think that you should ever run for any office that you do not seek to win. The way I view it, there are so many people in that it's going to be a wide open field, at least through the first quarter. And then, going into the second quarter, there'll be more and more of a contest — not just over initial media splash, but really ideas. What kinds of ideas are you going to bring to the table and what makes you different than the others? So I think by the time the debates begin happening in the middle of the summer, people will have to stand on their own two feet. And I think the challenge for somebody like me is to make sure that there is enough oxygen out there for people to understand what we're about. And then it will be up to me, through substance, to put enough meat on the bones to outlast the flavor of the month period that's coming up. Kevin Tidmarsh produced the broadcast version of this story. Do not accuse Pete Buttigieg of thinking small. He is the Democratic mayor of South Bend, Ind. He is 37 years old, and he is running for president. PETE BUTTIGIEG: And I'm also conscious, as someone from a new generation, somebody living in a part of the country that has been neglected but, in many ways, holds the key to, I believe, our social and political life, that I have something to offer that is different. INSKEEP: Pete Buttigieg has spent two terms as mayor. And during that time, he took a leave to serve with the Navy Reserve in Afghanistan. He is openly gay. And he is author of a new memoir called "Shortest Way Home." Analysts assume Buttigieg is a long shot in a crowded presidential field. But when you talk with him, you hear the thinking of a Democrat who may have a long career ahead. BUTTIGIEG: The biggest thing that has happened is we transformed the trajectory of our city. This is a community that was written off as dying at the beginning of this decade. Now it's growing again. Any executive role, especially the presidency, there are three parts to it. It's competently running an administration. It's implementing good policies. And above all, it's calling people to their highest values in tough times and bringing them together. I think a good mayor does that. I think we've been able to do that in South Bend. I think that's missing in the White House right now, and that's got to change. INSKEEP: What was your approach to creating jobs? BUTTIGIEG: Well, we tried to make sure that we were diversifying our economy. We recognized that the auto industry that built our city was not going to come back in its old form. And so we had to conquer the temptation to do what's sometimes called smokestack chasing - you know, a giant, lucrative economic incentive in order to land the big facility or factory that's supposed to be the salvation to our problems. Don't get me wrong. We're still doing manufacturing. We're still growing an industry. But we recognize that it's increasingly automated, and there's got to be more to the story. That's why we're growing an industry in data centers and industries that didn't even exist when our town was making Studebakers back in the '60s. INSKEEP: So we have a source native of South Bend who says that in spite of the job growth in South Bend that you have a persistent homeless problem. Is that correct? BUTTIGIEG: It's certainly the case that we have issues with homelessness. And we've worked very hard on that. I'd also say my administration has acted more aggressively and committed more resources to this issue than at any time since, I think, our city first got its Center for the Homeless in 1988. INSKEEP: You've had to break up 10 cities, from time to time? BUTTIGIEG: Not exactly, but we did have to do cleaning operations and really discourage encampments from forming. INSKEEP: Oh, meaning you moved them. They didn't want to go, but you felt it was for their own good, as well as the city's own good. BUTTIGIEG: Well, actually, constitutionally, somebody's within their rights to be in a public right of way. But we did come through and do cleaning with areas where it was clearly becoming unsafe. But what we tried, most of all, to do was to make sure that people understood that there were alternative resources and to increase the availability of permanent supportive housing. So for example, one of the locations where we saw the most people in camp two winters ago, we found now that more of those people are indoors, thank goodness. INSKEEP: When I was getting ready for this interview, I ran across a photograph, and it shows Mayor Pete Buttigieg walking down a street in South Bend with a person described as his Harvard classmate, Mark Zuckerberg of Facebook. How well do you know him? BUTTIGIEG: Fairly well. He decided that he wanted to visit all 50 states. When I met him, I told him if he was going to visit Indiana, he really should come see what's going on in South Bend. I was eager to show off our tech sector. He seemed more interested in the Juvenile Justice Center. INSKEEP: What did you see in the Juvenile Justice Center? BUTTIGIEG: One of the most striking things, actually, is the role that social media played in their lives. And shockingly, one of the top origin stories for a lot of cases of violence often affecting young people is disagreement. And a lot of that plays out on social media now. INSKEEP: In your judgment, is Zuckerberg doing enough to improve the public debate that takes place on Facebook? BUTTIGIEG: I think he's taking those responsibilities seriously. But I think he's also confronted - and every one of these big companies - with the reality that their corporate policy decisions are now public policy decisions. And I don't know if he's fully been able to master that, and I don't know that anybody in the sector has. INSKEEP: If they are public policy decisions, would you, if elected president, be moving to regulate companies such as Facebook? BUTTIGIEG: There's no question that the U.S. needs a comprehensive data policy. And I would look across the Atlantic here. Many countries have been very intentional about establishing people's rights when it comes to data. Even just clarifying that you are the owner of your data has a lot of implications, and I think it's something we need to look at. INSKEEP: Meaning you would favor something like the European standard for data protection. BUTTIGIEG: Something like that. We have to have that conversation. INSKEEP: What would you say if Zuckerberg called you back and said, listen; I had a nice tour of the juvenile justice system, but I'm really concerned about what you're saying here about data? BUTTIGIEG: Well, I think that as somebody who cares about what his product is doing for and to the country and the world that he should take these questions seriously. I imagine that he does, and I think that this is a legitimate and important public policy conversation that we simply have to have. We can't allow one of the most important dimensions of our citizenship, of our life and society to be left in a complete Wild West environment. INSKEEP: Is there one issue you want to leave us with that you expect to be the centerpiece of the 2020 campaign, whoever the nominee might be? BUTTIGIEG: I think the big issue has to do with intergenerational justice. There is a question now of what kind of world this is going to be in 2054, which is when I'll reach the current age of the current president. And we have got to change the trajectory that we're on so that mine is not the first generation to be worse off economically than my parents' was. And if there's one center of gravity to all of it, I think it's this question of the future. INSKEEP: Pete Buttigieg is the mayor of South Bend, Ind., Democratic presidential candidate and author of a book called "Shortest Way Home." Thanks so much. BUTTIGIEG: Thank you. Transcript provided by NPR, Copyright NPR. Monday Politics Chat: An All-Ohio Presidential Election? 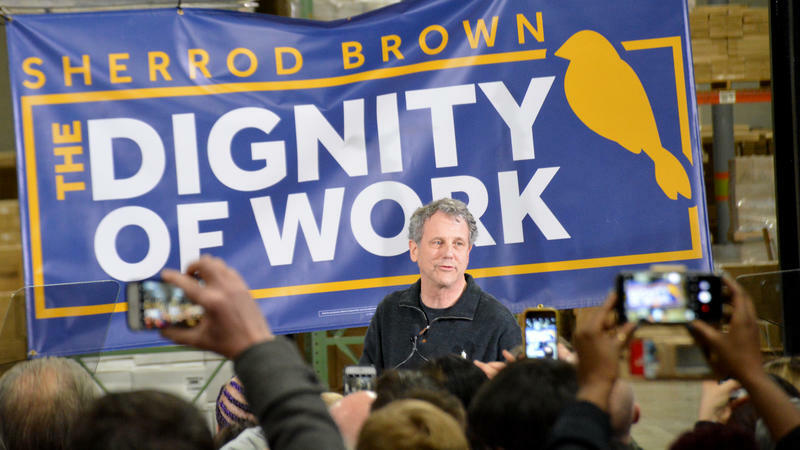 WVXU politics reporter Howard Wilkinson spoke with News Director Maryanne Zeleznik Monday morning about the fact that one Ohio Republican - soon-to-be-former governor John Kasixh - and one Ohio Democrat - newly-re-elected Sen. Sherrod Brown are clearly interested in being the next president.